There are a variety of experimental models of acute renal dysfunction and injury for the study of nephrotoxicity. These models include whole animals, isolated perfused kidneys, preparations for the study of the renal microcirculation (including juxtamedullary nephron preparation, hydronephrotic kidney, isolated perfused afferent arteriole, isolated perfused juxtaglomerular apparatus), isolated proximal tubules and cultured tubular cells. 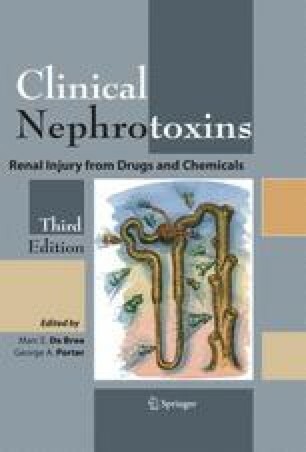 In this chapter, three commonly used animal models: whole animals, isolated perfused kidneys, and preparations for the study of the renal microcirculation, will be reviewed. Because the functional effect of a nephrotoxin can include vascular, intraluminal, and direct tubular cell effects, no single experimental model is ideally suited to study the pathophysiology of nephrotoxic injury. Also, each technique also has major limitations which must be appreci ated when interpreting the results. However certain models are useful for studying specific types of neprotoxic injury. For example, techniques for study of the microcirculation are ideal to study drugs that cause acute renal dysfunction on a vascular basis. These drugs include prostaglandin inhibitors e.g non steroidal anti-inflammatory drugs (NSAIDs)., direct vasoconstrictors e.g cyclosporine and angiotensin II blockers e.g. angioten sin converting enzyme (ACE) inhibitors. Each model, when appropriately applied and interpreted, produces useful information. However, it should be emphasized that complementary models and approaches need to be used to study a particular nephrotoxin. For example, tubular damage caused by intramuscular injection of glycerol is caused by heme toxicity and is due to a combination of factors that include severe intrarenal vasoconstriction, heme-mediated oxidant injury to tubular cells and obstruction of distal tubules by casts of acid hematin.